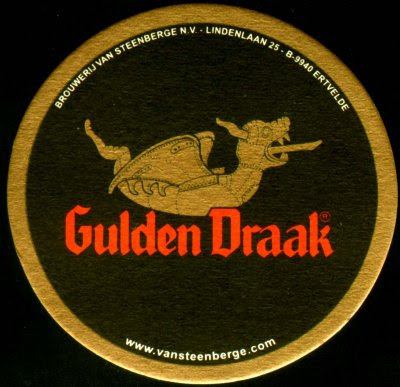 "Did you know the Gulden Draak (Golden Dragon) owes its name to the gilded statue on top of the Belfry in Ghent? 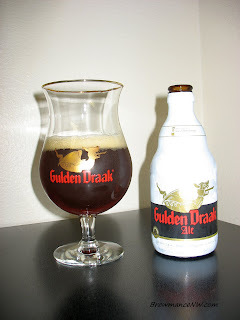 Tip: Replace the whiskey in Irish coffee by Gulden Draak or have Gulden Draak with Pas de Bleu: surprising and typical for Ghent. You will be amazed. Fermentation both in the bottle as in the barrel, ensures a preservability for years with evolution in taste." Grabbed a 6-pack box of 330 ml bottles with glass from By The Bottle here in Vancouver, WA. Served at about 58 deg. F.
- Frothy light tan fingers of foamy creamy head, settles to pillowing blankets and spotty patches all about the tulip. Dark filtered ruby red/brown brew. This puppy looks wicked. - Sharp fruity esters. Belgian yeast galore. Sweet fruits, strawberry, banana, and some clove spice. Herbal and grassy. Sweet malt without a lot of bready and biscuit character. Certainly a unique smelling brew. Light alcohol aromas. - Oh my. Esters, fruit, prune, light bitter strawberry, fig, and many herbal notes all over the palate. Lots of raisins. Sweet without being overpowering. Alcohol is absent in the flavors, but only shows up later in the stomach. Candy sugars, clove and molasses. Slight bready yeast notes. Fantastic brew. - As usual,I have a slight beef with Belgian yeasts. I love the flavor character of them, but I rather dislike how bubbly they are. I like more mild carbonation in my beers. As it sits and warms, it remains quite bubbly. It's sticky, and cloying. Slight dry feel. Overall expected and not bad. - Hard to find, expensive, and rare in these parts. I'm glad I ran across it. Your average consumer won't be out looking for it. I suggest anyone reading this to go seek it out. It's a stellar beer. It's to be had slightly warm, and is a sipper. Drink it, and pair it with some nice red meats and crisped veggies. Perhaps some spicy stuff as well. It's solid and truly shows the art form of brewing.